This story originally appeared on OurTown by Mary Owen. It has been reposted with permission. The Mintens adopted Courage after their daughter, Alex, met him while on a trip to Dodowa, Ghana in 2010 for a college internship. Eventually she encouraged her parents to consider making him a part of their family. At the time, Courage was in the 3rd grade, and was one of several students sponsored to attend a Christian school in the West African country, and lived at the local orphanage where Alex volunteered while she worked toward her undergraduate degree in human services from Oregon State University. Soon their friendship grew, and Alex convinced her parents, Russ and Kim, and other family members to sponsor Courage’s education with the hope that someday he would attend college or visit the U.S. The Mintens prayed about this life-changing decision and decided to pursue the idea. In October 2012, they started adoption proceedings. The Mintens were finally granted a court decision making Courage their son in September of 2013. In October, they requested his visa interview. A month later, after jumping through many legal hoops and with his visa granted, they brought Courage home. “We arrived in the U.S. with our son the week before Thanksgiving and with much to be thankful for,” Kim said. During his first few months with his new family, Courage enjoyed trips to the beach, hiking at Silver Falls, visiting OMSI, and going to Timberline for his first glimpse of snow. He played basketball and soccer, rode his bike, listened to music – all typical teenage activities. He attended St. Mary Catholic School, where teachers and staff helped him to adjust to his new cultural and educational environment. The family has strong connections to Catholic education. Russ and Kim both graduated from a catholic high school, along with Alex and her sister, Mackenzie. Now an OSU graduate, Alex works as a social services director at a nursing home in Wilsonville. Mackenzie will be a sophomore at the University of Portland where she is studying to become a nurse. And Courage started eighth grade at St. Mary’s this fall. Courage enjoyed playing soccer for Stayton High School, and went on his first camping trip with his family to the Metolius River in Camp Sherman in Central Oregon. “I liked hiking and sitting around the campfire,” Courage said. “It was pretty cool. It’s fun to spend time away from home in the woods and experience new things.” The family went on two more camping trips this past summer, including a family reunion weekend where he met a lot of new cousins. He also got to try out waterskiing and backpacking, his mother said. 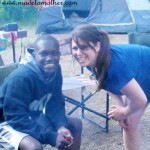 So what does he love most about camping trips? “Swimming and fishing,” he said. Other day trips Courage has taken include going to the zoo, state fair, a local rodeo and even his first experience at “an American wedding,” said Kim, who celebrated 25 years of marriage with Russ about nine days after bringing Courage home from Ghana. Kim said the lengthy process and overall experience of adopting Courage has changed her perspective on the American way of life. “I look at everything differently, and try to look at things through his eyes,” she said. “I want him to remember what it’s like to do without and appreciate all the things God has given him.